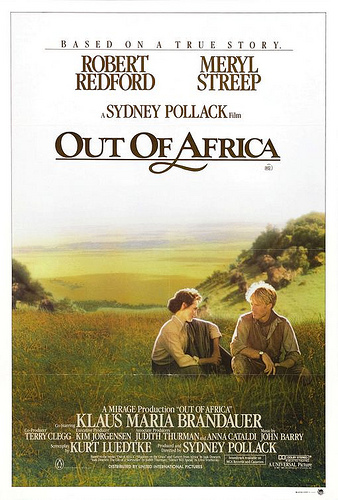 "Last night I dreamed of Africa..."
Based on the eponymous novel by Isak Dinesen, pen name of Danish writer Karen Blixen, Out of Africa tells of Blixen's time in the Kenyan highlands, her unhappy marriage, her attempts at a failed coffee farm, and her romance with big game hunter Denys Finch-Hatton. Meryl Streep gives one of the best performances of her career opposite Robert Redford as Denys Finch-Hatton and Klaus-Maria Brandauer as Bror Blixen. Expertly directed by Sydney Pollack, incredibly scored by John Barry, and showcasing the very best of the African landscape, Out of Africa has well earned its place as #13 on AFI's 100 Years: 100 Passions. The incredible acting, smoking-hot chemistry, and heartrending storyline vault this epic romance into the same league as Gone with the Wind, From Here to Eternity, and Casablanca. Crowning Music of Awesome: The Oscar winning score by John Barry. Great White Hunter: Denys Finch-Hatton. Not Even Bothering with the Accent: Robert Redford. This page was last edited on 1 October 2017, at 15:41.